The Inspiration: Lloyd Simmonds, MAC makeup artist, told us that the Vena Cava collection has a chic 70's vibe that the designers wanted to contrast with the hair and makeup to break up the look a bit. The makeup is meant to evoke a lady who has been horse back riding all day long in cold weather and has just arrived home and decided to go back to town looking just as she is,windblown and sun kissed. Eyes: Taupe Pro Blush was applied softly in crease, Style Predator EyeShadow was applied on the whole eye, and Pro Shine Was topped off lids for a glossy effect. The makeup artist also showed bloggers a shadow that was being used but won’t be available until fall ’10, a peachy golden shade with the working name October Day. Finally, Black Pro Lash was applied only to upper lashes and models were given a nicely groomed and brushed up brow. Blush: This involved three or more blushes combined for that windblown,sun kissed effect! First, Sepia was applied for across the cheekbones and face for a tanned effect. This is mixed with an Antique Gold powder across cheekbones, forehead and nose. Finally, Orange Alarm is added for a sunkissed effect on bridge of nose, brushed into hairline and neckbone to give effect of blood rising in the skin. Shine Wax is then applied on cheek bones to finish. Lips: This was the standout element of the look: vibrant vermillion lips. 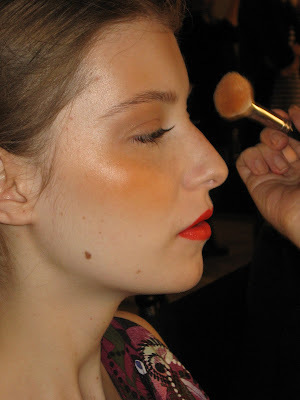 The artists used MAC Pro Red Lip Mix pigment, applied in a natural shape but with intensity. 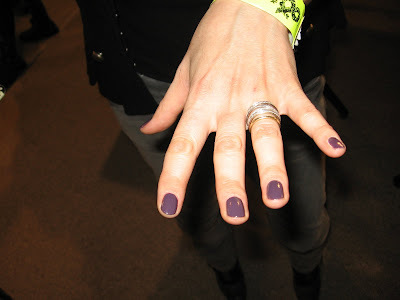 Fabulous Smoky Grape Nails:An exciting surprise was getting to meet Nonie Creme, Founding Creative Director of fab nail polish line, butter London. Nonie collaborated with Vena Cava to create a custom nail polish mix for the show. It is called Marrow and is a deep, muted gray purple. Nonie said that everyone was getting tired of the same deep wine polishes and wanted to make something that was still a deep, rich shade but more earthy. The color began with a deep burgundy shade to which black and navy were added. Then a white pigment was added to give the polish a filmy quality. Nonie told us the polish might come out in fall ’10 in limited edition. In the meantime, she suggests that we all just act like mad scientists and try adding black and brown to our current wine polishes. A final tip: only mix polishes from within the same product line for the best quality/effect. 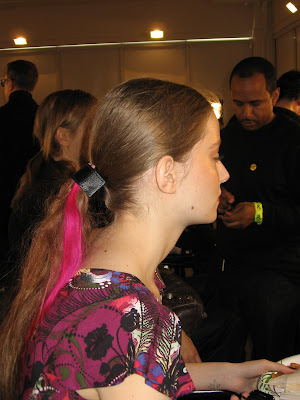 Hair: All hail the ponytail! Huge thanks to Angie and Jessica for this coverage! I appreciate it sooooooooo much! BTW: That first model looks like Blair Waldorf from Gossip Girl. I have to have that polish. It is " off the hook" FABULOUS. I love all of the application details, so often I read "xyz blush was used, abc eyeshadow was used" but no detail as to layering or application. So awesome and useful, thanks! I love a moody,dusty, deep purple polish. It has been my mission as of late to find the perfect one. Ahhhhh... need that nail polish! I love this look though, I would love to rock it and soon! Go away snow! LOVE the nails, and LOVE the red lips! I am going to start inventing nail colours now ladies - thanks for the tip! 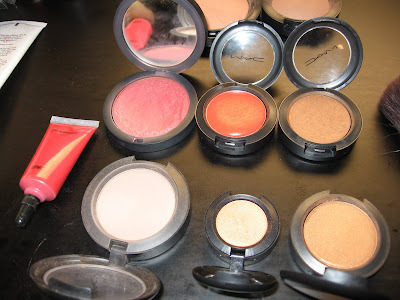 As for the red lip pigment, I'm going to have to scour the net to find this stuff... MAC, please make these pro items available to your general, adoring public! !